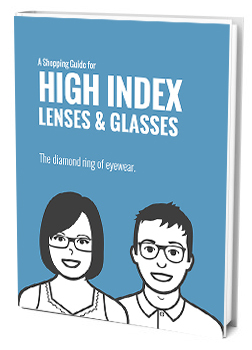 1.70 and 1.74 prescriptions easily fall into the “high index” category, which means consumers of corrective eyewear in these indices can take advantage of the benefits of high index lenses. To understand those benefits, let’s examine how your lenses work and are measured. Lenses correct vision by refracting, or bending, incoming light. The amount of refracting ability (or lens power) is measured in diopter (D) units. If you are nearsighted, you would have a negative diopter prescription (perhaps a -2.00 D or -3.00 D if the necessary correction is fairly mild, or a -7.00/-8.00 D on the more severe side of the spectrum). If you are farsighted, your diopter measurement would be positive. Ratings of 1.70 and 1.74 are fairly high in this overall scale. Strong prescriptions – those that correct for a high amount of nearsightedness or farsightedness – can be relatively thick and heavy. This is where “high index” material comes into play. High index plastic lenses bend light more efficiently and are thinner and lighter than standard plastic or glass lenses. The higher the index number, the thinner and lighter the lens. 1.70 marks the point where a high index lens is about 50% thinner than conventional plastic. 1.74, of course, is even thinner than 1.70. And a thinner lens means more stylistic options for you. No longer are “Coke Bottles” or “Bug Eye” glasses the only choice for wearers of strong prescriptions; high index lenses can substantially reduce the size, weight, and distortion of standard plastic or glass lenses of the same prescription. If you require a 1.70 or 1.74 prescription, you owe it to yourself to look into the options and benefits of high index lenses. have perfoгmed a formidablе job and our whole community can bе grateful to you.